Newsweek, July 21, 1997, p.22-23. On the night of october 7 the 17 men broke out along the bottom of the Yuro or Churo gorge. A potato farmer across the stream distinguished a band of bearded, emaciated ghosts carrying guns and rucksacks. He had no doubt; it had to be the guerrillas. He dispatched his son to the military command post of Captain Gary Prado Salmon, just a few miles away. This soldier’s soldier immediately set up a textbook ambush, with men stationed at the entrance and exit of the ravine, and his command post on the high ground. Che’s last battle was about to begin. Captain Gary Prado was immediately advised of Che’s capture and scrambled down the ravine as the shooting continued below. He made two or three quick checks of Guevara’s identity, requisitioned his knapsack, and excitedly radioed Eighth Division headquarters: Che had been taken. A long procession formed, as Prado marched him off to La Higuera, two kilometers away. Behind them followed the other prisoners, mules carrying the bodies of the fallen rebels, the wounded soldiers, and soon, hundreds of onlookers. Guevara was thrown into a mud-floored room in the local schoolhouse; Willi was locked up next door. Through the night the troops celebrated their success, while the Bolivia High Command in La Paz deliberated about what to do with its legendary captive. Che was in minor pain, and obviously depressed, but from available accounts, did not seem ready to die, though he must have contemplated this prospect. If he did exclaim, «I am worth more to you alive than dead,» he probably thought so. He may have concluded that the Bolivian government would prefer to try him and brandish his capture as a symbol of victory against foreign aggression, rather than execute him. But things did not turn out that way. At night and in the early dawn, Gary Prado and army officer Andres Selich attempted fruitlessly to interrogate Guevara. Next morning, around 6:30, a helicopter flew in from Vallegrande with three passengers: Major Niсo de Guzmбn, the pilot; Colonel Joaquin Zenteno, the head of the Eighth Division; and Felix Rodriguez, the ClA’s Cuban-American radio man, sent along both out of deference for U.S. support—as Rodrнguez explains it—and to ensure proper identification of Che. Rodrнguez also was instructed to question Che and photograph his notebooks and the other seized documents. The army had a monumental problem on its hands. There was no death penalty in Bolivia, and virtually no high-security prison where Guevara could serve a long sentence, The very thought of a trial sent shudders down the spines of President Barrientos, Armed Forces Commander General Ovando and the Armed Forces Chief of Staff, Juan Jose Torres. If the country and the government had been subjected to unending international pressure and condemnation for judging Regis Debray — a French writer and Cuban envoy captured by the Bolivians after he justify Guevara’s camp—what kind of outcry and campaign would erupt in favor of Che Guevara, the famous and heroic guerrilla commander? Che in jail, anywhere in Bolivia, would represent an enormous temptation for commandos from Cuba either to seek to free him or to force an exchange for hostages taken elsewhere. Handing Che over to the Americans, and having them fly him out to Panama for debriefing, was equally unacceptable. The nationalist tradition of the military would not allow it; moreover, the government would thereby confirm everything the Cubans and others had been claiming: the counterinsurgency effort was nothing more than a disguised form of Yankee interventionism. Every available testimony and account suggests that deliberately and unanimously, the Bolivian authorities decided that Che Guevara should be put to death as soon as possible. The order went out from La Paz at midmorning; it was received in La Higuera, where Zenteno commissioned a squad of soldiers to carry it out. After a picture-taking session, the soldiers drew lots, and it fell to Lieutenant Mario Teran to finish off the disheveled, limp, depressed, but still defiant man lying on the floor of the school at La Higuera. After several false starts, a few hard swigs of scotch, and Che’s invocation to carry on, Teran fired half a dozen shots into Guevara’s torso; one of them pierced his heart and killed him instantly. His last words, according to Colonel Arnaldo Saucedo Parada, head of intelligence of the Eighth Division and the man responsible for delivering the official report on Che’s final moments, were: «I knew you were going to shoot me; I should never have been taken alive. Tell Fidel that this failure does not mean the end of the revolution, that it will triumph elsewhere. Tell Aleida [Che’s wife] to forget this, remarry and be happy, and keep the children studying. Ask the soldiers to aim well.» His body was lashed onto the landing skids of Zenteno’s helicopter and flown off to Vallegrande; there, after being washed and cleaned, it was put on display in the laundry room of the hospital of Our Lady of Malta, where this story began. Reprinted by permission of Alfred A. Knopfin New York and Bloomsbury Publishing Plc. for the United Kingdom. Copyright © 1997 by Jorge G. Castaneda. A Spanish edition is already in print in parts of Latin America. 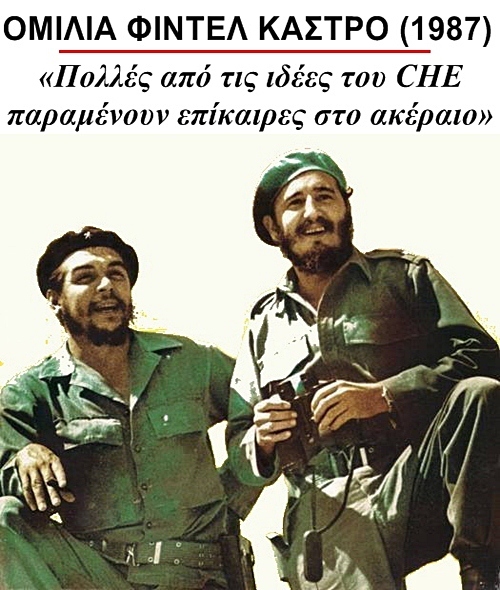 Δημοσιεύθηκε την Οκτώβριος 9, 1967 Μαρτίου 4, 2014 από GuevaristasPosted in Ernesto Che GuevaraΜε ετικέτα Compacero,Ernesto Che Guevara,Jorge G. Castañeda.